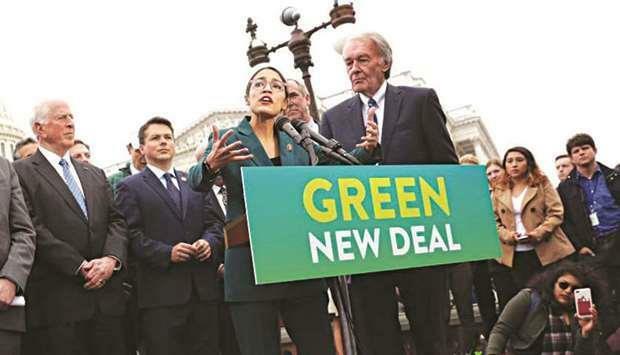 (MENAFN - Gulf Times) The 'Green New Deal (GND) proposed by progressives in the United States cannot be achieved in isolation. To tackle climate change and inequality together, all countries will need to agree to new rules for international co-operation. The first conference ended with British prime minister Gordon Brown announcing a 'new world order founded on 'a new progressive era of international co-operation; the second ended in disarray. Yet, looking back, the false dawn of that 'new progressive era has proved to be the bigger obstacle to a secure and stable future. For a decade now, the post-crisis recovery has oscillated between anaemic growth spurts and recurrent bouts of financial instability, owing partly to advanced economies' discordant mix of aggressively loose monetary policies and dogged fiscal austerity. And this has all been supported by massive build-up of debt, which has increased by more than $70tn worldwide since the crisis. But the recovery's sluggishness also owes something to the intertwining of corporate and political power under financialised capitalism. As economic power has become increasingly concentrated, inequality both within and among countries has reached grotesque heights. With financial speculation now commonplace, so, too, are fraud and instability. Meanwhile, investment in public goods globally and nationally has stagnated, and growth has become dependent on resource extraction and energy consumption, both of which are proceeding at such a pace as to threaten human civilisation itself. For all the ambitious talk in London a decade ago, little has changed. Debates about improving global governance still revolve around ideas like 'corporate social responsibility, 'public-private partnerships, and 'free-trade agreements, none of which will bring about a fairer and more stable economic order. Complicating matters further, global environmental conditions have become increasingly fragile since 2009. And even before US President Donald Trump's truculent decision to abandon the 2015 Paris climate agreement, there was no clear path to keeping global temperatures below a level that scientists deem safe, let alone to preventing a more catastrophic breakdown. The problem is that multilateral rulemaking in recent decades has been subject to the same political pressures as domestic policymaking. It is not a coincidence that the current framework for governing the global economy primarily benefits financial entities and large multinational corporations. The original goal of post-war multilateralism was to protect the weak from the strong so that they could grow. Yet its current version encourages strong countries to impose their preferred development model on the weak, thereby promulgating a world of 'winner-takes-most outcomes. Under these conditions, fine-tuning existing arrangements simply will not do. To make a global GND work, many of the multilateral programs that have accumulated over decades will have to be culled, and a new generation of smarter institutions will have to be established. Still, the multilateral landscape itself would continue to resemble what US President Franklin D Roosevelt envisioned when he called for a mutual understanding that would 'secure to every nation a healthy peacetime life for its inhabitants everywhere in the world. * Kevin P Gallagher is professor of Global Development Policy at Boston University's Frederick S Pardee School of Global Studies.